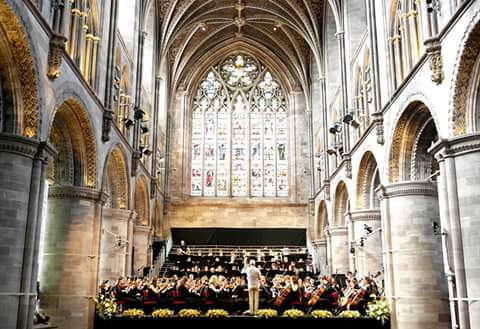 The first time I ever played in Hereford cathedral was in my first year in NYOW, seven years ago, as part of the Three Choirs Festival. I was excited to play in such an amazing place and the concert didn’t disappoint. Performing Mahler’s first symphony to a full house was an experience I’ll never forget. I remember it being a boiling hot day and as we waited around for the concert to start (the changing rooms were in a school which was unbearably warm) we sat outside the cathedral on the grass eating ice cream and relaxing. This is my third performance in Hereford Cathedral and every time the NYOW has visited it’s need a beautiful sunny day and this year was no different. The programs however, are polar opposites. As I’ve said previously the main piece in the program is the Rite of Spring. I love this piece, but I was a tad dubious how well it would come across in the cathedral, due to the booming acoustics. I needn’t have worried. Although you couldn’t trust your ears with all of the echos bouncing around, the audience was full and I thought that the performance was exciting, even if there were a few bits where the ensemble rocked. The audience seemed to love it and were very complimentary afterwards. It’s now the last day of NYOW 2015, we’re currently on the coach driving to Cardiff, and I’m not quite sure how to feel. I’m obviously very sad that it’s all over and I’m at a slight loss as to how I’ll spend my summer next year, but at the same time I’m really looking forward to the Cardiff concert tonight in St David’s Hall. It’s going to be an amazing way to finish off the last seven years as a member of the NYOW. Grace Notes: NYOW 2015 – Fancy Dress! There wasn’t a concert for the majority of the orchestra yesterday. We spent the day in Aberystwyth having some free time while the composers rehearsed with their ensembles for their first concert. After we’d finished watching their concert we had a mad dash back to Lampeter because the ‘Nash’ was having a feature on the BBC Radio Wales Art Show. I was interviewed along with Matt Jones (NYAW Manager (Youth Music)) about what it’s like on the course and why it’s such a special experience. You can listen to it for the next few days here. Then in the evening was fancy dress, one of my favourite events of the course. I’ve talked about previous years here, but this year the theme was ‘La Peri’. 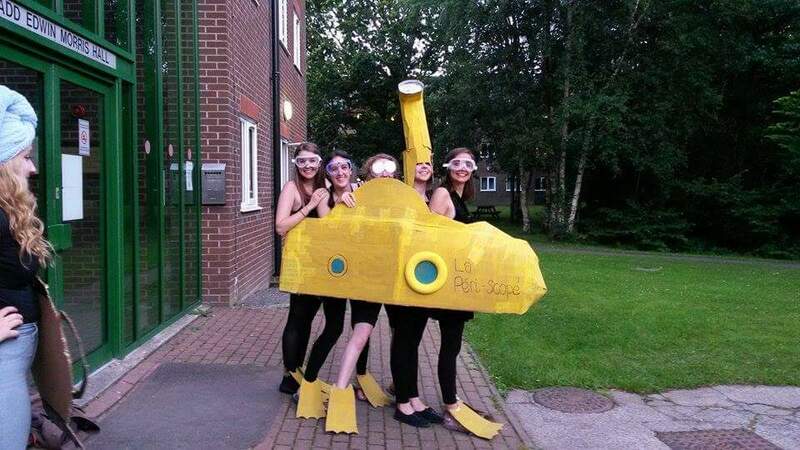 So we decided to go as a submarine with a periscope (get it? ?… A tad tenuous I know, but it’s a hard theme!). We then all dressed as scuba divers and piled in the cardboard submarine. The finished costume! The flippers were so hard to walk in! I’m pleased to say we won! And I’m very proud of our efforts! The rest of the night was great, especially negotiating the SU with cardboard flippers attached to your feet! We’re currently driving to Hereford and I’m really looking forward to the concert this afternoon!